So is simply dressed: a black, silk, long-sleeved shirt with Mandarin collar; matching trousers; black shoes with brass trimmings. He often tents his hands, then to emphasize a point, gestures with his palms downward as if enchanting a coffee mug in front of him. "Its hard to cheat people and remain successful in feng shui because relationships last a long time and your track record speaks for itself," he said. So, who refers to himself as a consultant, helps clients design their buildings, and orient their building interiors to draw good fortune. He reads faces and palms, combining observation with data about the time and date of birth to predict the future. He's booked six months in advance and boasts 1,000 customers a year, each of whom deposits an HK$8,000 retainer for a 45-minute meeting. He's grossing HK$8 million a year - just from feng shui, if his figures are right. 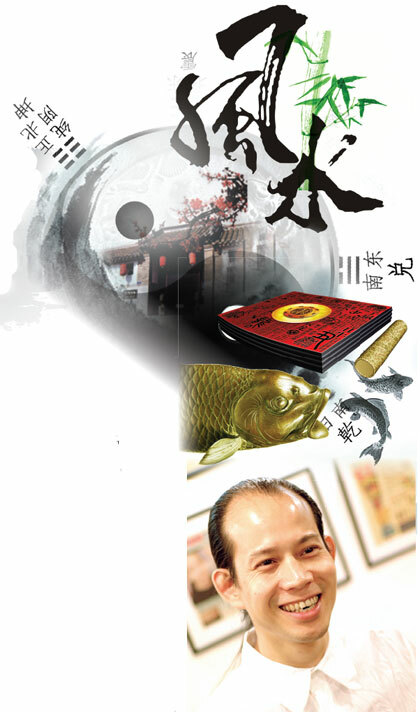 He is one of the most recognizable feng shui figures in Hong Kong; built slightly, his hair is pulled back in a ponytail, that's become his signature and the thinning widow's peak seen on the covers of all his books. "All my customers are referrals. There is no signage downstairs to show you where my office is," he said, although he is readably found through Google. He claims no favoritism for the rich and famous, but his clientele has included the likes of Faye Wong and Jacky Cheung Hok-yau. A site visit he can manage to attend within a month. He makes careful observations of the site and its surroundings, consulting a Chinese compass covered with inscriptions. The device helps calculate how furniture should be rearranged, what needs repainting, what colors the drapes or the bed sheets should be, which direction the person should lie while sleeping, where a sofa should face and which window offers the best view for placing a desk. So credits himself with bringing the art of feng shui, previously the domain of the super rich, to the everyday man through the medium of quasi-self help booklets available at convenience stores around town. He says he sells about 150,000 copies a year, excluding his popular fortune almanacs which have begun sprouting up ahead of the lunar new year at magazine racks. They take prominence ahead of glamor, gossip and special interest publications. So agrees a large proportion of the population does not believe in feng shui or fortune telling, and that many of his clients seek him out in pursuit of some sort of eleventh-hour deliverance. "There are sick clients who can't find cures from Western or Chinese doctors and so feng shui becomes a sort of last resort for them," he said. He speaks quickly and vaguely sometimes. At other times his words seem carefully measured and succinct. Unmarried with no children, he describes himself as cold and without compassion, despite having an easy smile. "I cannot allow myself to get too caught up emotionally, because I'm dealing with many sick, dying people or people in dire straits," So said. 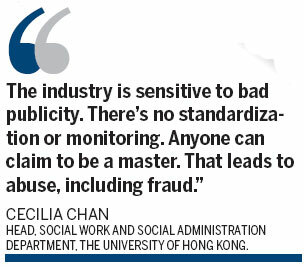 Even the most skeptical of people can be captivated by the mystic arts given the right mindset, according to HKU's Cecilia Chan. "Hong Kong people are pragmatic people, but, in lieu of any rational means to tackle their problems, they look for alternatives. These include feng shui, Chinese medicine and fortune telling," she said. "Feng shui masters give them support against supernatural forces which make people feel more comfortable. There's little self-disclosure," Chan said, noting, "Hong Kongers are not comfortable talking to therapists. It's a Chinese tradition that you shouldn't wash your dirty laundry in public. It's a shame-based culture with elements of karma. For example if you're sick, you probably did something wrong in a past life," Chan said. "Feng shui is on par with beauty consultancy but people don't like to advertise their belief in it. There is a stigma to being labeled superstitious," she said. The way feng shui has sold itself as a quasi-mystical practice has done little to earn it any real legitimacy, but it remains a practice observed by the eccentric, the rich, the government and ordinary people trying to hedge their bets and turn their luck around.